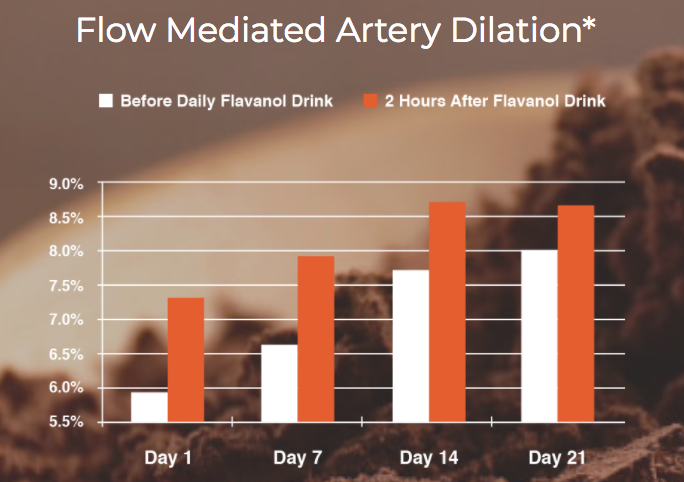 A recent study published in the British Journal of Nutrition showed a remarkable 24% increase in flow mediated artery dilation (FMD), a common measure of blood vessel function and circulation, just two hours after participants consumed their very first portion of cocoa flavanols. Investigators selected the two-hour point to measure near-term benefits because cocoa flavanol levels generally peak at about that time and dissipate in your system approximately six hours later. Increases in FMD following flavanol consumption climbed steadily with daily use, nearly doubling by week three. Perhaps more impressive, participants showed a 36% increase in FMD before consuming a single cocoa flavanol on day 21, demonstrating a longer-term benefit of cocoa flavanols that builds with daily consumption. Participants in this important study consumed 900mg of cocoa flavanols per day.